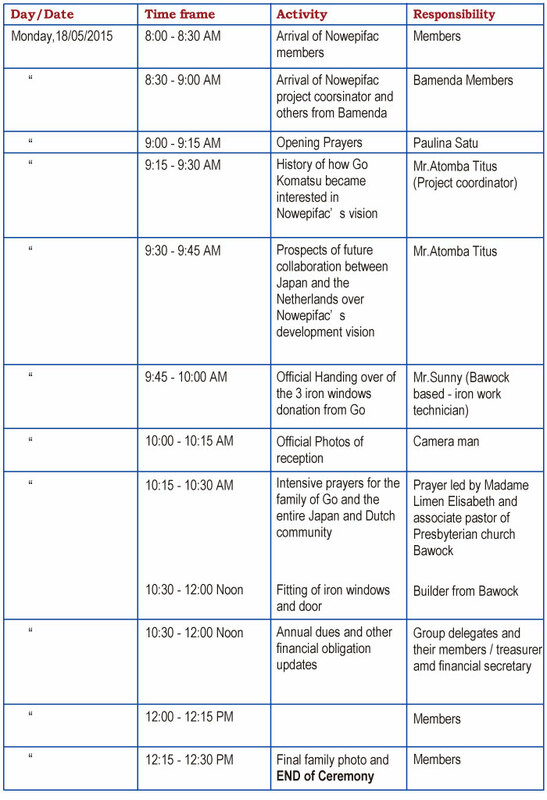 Report on the 2015 "SOS Japan Project"
Atomba Titus met for the first time with Go Komatsu in the city of Tokyo at the Tokyo Union Church(TUC) in 2014 where Titus made a power point presentation of his work with pig farmers in Cameroon to his fellow participant colleagues of the Asian Rural Institute and some members of TUC. 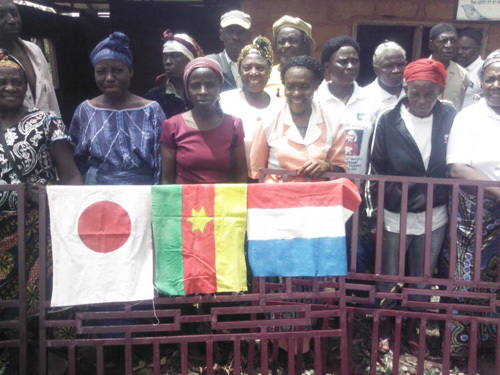 After the presentation that caught the minds of Go as well as many others, Titus had more time together with go to share more of his field experience with him since he was privileged to spend the night at the family home of Go Komatsu. After exchanging contact E-mail addresses, Titus and Go remain connected to each other as Go was in Tokyo and Titus in Toichigi prefecture in Japan. 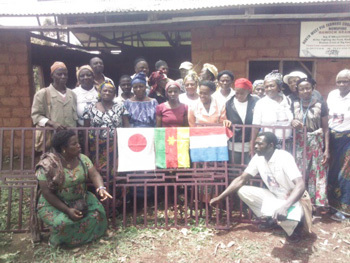 Back to Cameroon in December 2014, communications between Titus and Go continuedand and Titus had to connect Go with the pig cooperative's Dutch partners in a relationship that is now growing in different dimensions and will hopefully continue in the months and years ahead. Go Komatsu is currently helping the North West pig Farmers Cooperative to build a new website which is yet to be launched by using current information and updating the old web site which is the fruits of the labor of a Dutch friend Hanneke Mertens who stand unchallenged as our only eye opener into the Dutch Community. 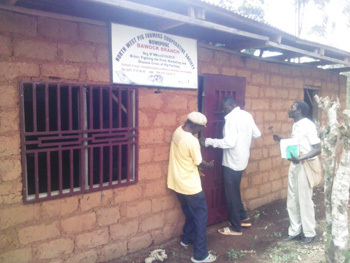 In line with the vision of the pig cooperative, Titus and Go discussed over a multiple of poverty alleviation and community development projects which the North West Pig farmers' Cooperative is envisaging in the months and years ahead. 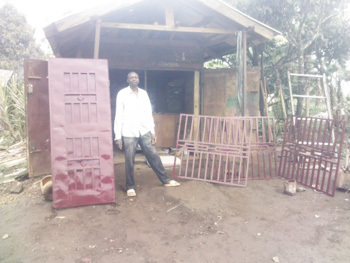 To set the ball rolling, Go and his mother, said, " a journey of several miles start from one step" so with the incomplete slaughter house project at hand, a donation of three iron window protectors can move the cooperative one step ahead. 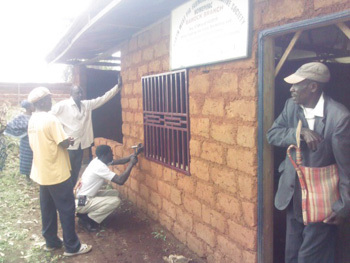 This report which recount the story of how the Cameroonian, Nowepifac community receive these windows is in appreciation of this wonderful gesture and hopefully signifies the beginning of an everlasting relationship with the Japanese people. Before the money transfer of 69.153frs CFA(14.000JPY) for the 3 iron windows in April, Go Komatsu had made a test transfer of 18.788frs CFA (4000JPY) on the 26th January 2015 to know the ease and transparency with which transaction can take place between Cameroon and Japan. Titus acknowledged the two transfers and the first which had no clear cut definition of function were used as internet communication credit. After several discussions between Go and Titus, it was agreed that priority be given to the slaughter house project so as to move it one step ahead. In a meeting that took place in Bawock we agreed that iron window protectors will be paramount. We thought also that our community cannot also depend only on foreign support so should put in their own contribution towards the success of the project. Each group member was expected to pay an annual due of 2000 FRS CFA. From what was realized from this contribution an iron door and one other iron window was made. As a way of empowering the members, an iron technician (Mr.Sunny) was chosen from amongst members of Matter Horn group so that income from that service can help him feed his family/pigs and pay his group contributions. The most important thing to note in this period before Monday 8th is the fact that we had several meetings with members and work supervision visits and the project coordinator had also several internet communications with Go Komatsu over a range of issues. These movements and communication entail some extra cost not found in any budget so making work a bit difficult for the project coordinator and his team. 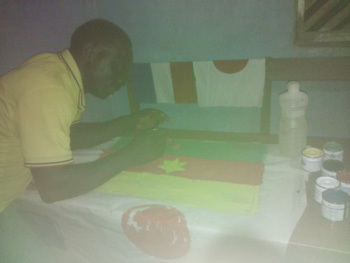 Creativity was seen in the works of the project coordinator who produced the flags of the three countries, Cameroon, Japan and the Netherlands to be use on Monday 18th as a symbol of Unity and collaboration between these 3 countries. Members arrived on time as scheduled and had to wait for a moment giving time to Mr. Sunny to complete his work on the windows. The agenda of the day was followed strictly. 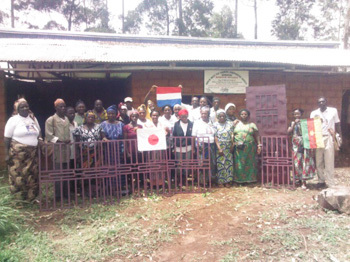 Members expressed a lot of joy and happiness and a prayer that lasted for close to 10 minutes led by Madam Limen Elisabeth, she ask God almighty to bless the entire Japanese community as well as our Dutch friends whom through their efforts we were able to get the helping hand of a Japanese friend. A financial statement was read to members as to how the funds were used, giving details of how much came from Japan and what came from group annual dues contribution. Mr Titus gave a brief history of how the relationship between Go Komatsu evolved and more over how our Dutch partners came to know Go last year. After handing the iron windows/door, Mr. Sunny assisted in putting them on the walls. Another closing prayer was again given by Madame Justina Mbianda who called on God to always stand by the people of Japan and the Netherland. NB;- The negative balance 0f 10.400Frs CFA will be augmented from annual due debt. Right: 3 Windows,- left(Japan), Slaughter house(Netherland), Iron door and single window,- right(NOWEPIFAC). Left: We love this tripartite friendship / Right: fitting the iron door. 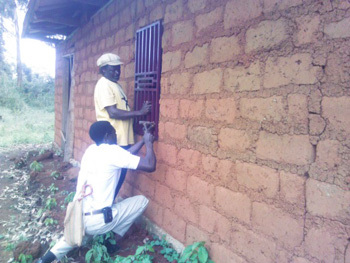 Left: Fitting the iron window (behind) / Right: Fitting the iron windows (in front).